all the pollutants present in the pond. 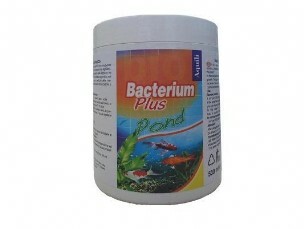 Bacterium Pond Plus is truly innovative because it decomposes NH3 NO2 NO3, but it is the first biological activator that works effectively on Phosphates. All laboratory tests have shown the effectiveness in all conditions andthe results are striking and immediately verifiable within 24 hours of introducing Bacterium Pon Plus into your pond. • Provides fast activation of the biological filter. • With its selective and antagonist action, it reduces the risk of diseases and fights algae. In this case it is very important that the filter has a correct flow and it is regularly cleaned. 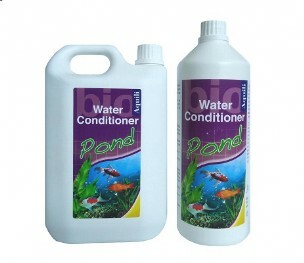 The water conditioner for POND, specifically designed for low temperatures, works immediately, turning the tap water into water suitable for the life of fish. • It adds iodine, magnesium and all the vitamins of the B group. 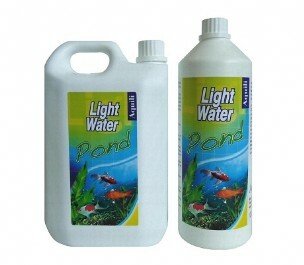 Makes pond water clear and bright as it binds the particles in suspension, both mecanic and organic. Light Water Pond combining them and making them fall allow to the filter to remove them. It is immediatly effective, the results are visible in few hours. Use only with values more then 2 d°KH. Leave at least 48 hours between one use and one other. Doses: 10 ml (1 cap) per 200 liters. 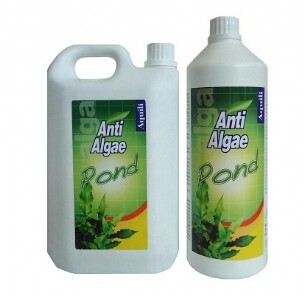 It inhibits the growth of every kind of algae on contact and without harming plants. • Shake well before using. Recommended dose is 10ml (1 cap) per 200 litres. • Before and after treatment, physically remove dead algae as it is quite harmful. • Ensure that the water has the highest oxygen level possible. • Based on the type of algae and the composition of the water, AntiAlgae will have maximum effect after 1-6 weeks. • Repeat treatment after 10 days if the algae problem is very serious.